HEK-Blue™ IFN-λ cells are designed to monitor the activation of the JAK-ISGF3-IRF pathway induced by interferons lambda (IFN-λ), also known as type III IFNs. These cells do not respond to type I and type II IFNs due to IFNAR2 and IFNGR1 gene knockouts. The IFN-λ family is essential to the antiviral response at epithelial barriers [1,2]. In humans, this family comprises four distinct proteins called IFN-λ1 (interleukin-29, IL-29), IFN-λ2 (IL-28A), IFN-λ3 (IL-28B), and the poorly secreted IFN-λ4. In mice, two functional orthologs (IL-28A and IL-28B) have been described. IFN-λs are produced when a viral infection is sensed by pattern recognition receptors. IFN-λs bind to a heterodimeric receptor formed by the assembly of IFNLR1 and IL10Rβ. 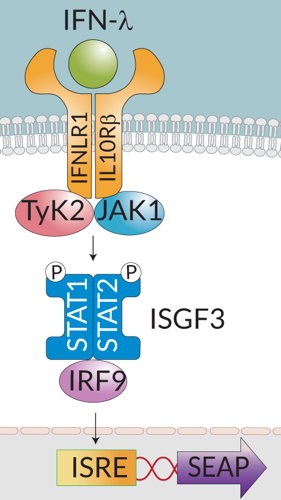 This leads to the recruitment of the Janus kinases, JAK1 and TyK2, and phosphorylation of STAT1 and STAT2, which then dimerize and interact with IFN regulatory factor 9 (IRF9), forming the ISGF3 complex. ISGF3 binds to IFN-stimulated response elements (ISRE) in the promoters of IFN-stimulated genes (ISG) to regulate their expression. HEK-Blue™ IFN-λ cells were generated by stable transfection of HEK293 cells with the human IFNLR and IL10R receptor genes, along with the human STAT2 and IRF9 genes to obtain a fully active IFN-λ signaling pathway. To detect pathway activation, these cells harbour the secreted embryonic alkaline phosphatase (SEAP) under the control of the ISG54 promoter that is activated by IFN-λ. Therefore, stimulation with human or murine IFN-λ triggers the JAK/STAT/ISGF3 pathway and induces SEAP production that can be monitored by a simple colorimetric assay with QUANTI-Blue™, a medium that turns purple/blue in the presence of SEAP. HEK-Blue™ IFN-λ cells are resistant to Blasticidin, Hygromycin, G418, Puromycin, and Zeocin™. 1. Lazear HM. et al., 2015. Interferon-λ: Immune Functions at Barrier Surfaces and Beyond. Immunity. 43(1):15-28. 2. Lee S. & Baldridge MT., 2017. Interferon- Lambda: A Potent Regulator of Intestinal Viral Infections. Front Immunol. 8:749. Response of HEK-Blue™ IFN-λ cells to type I, II and III IFNs: HEK-Blue™ IFN-λ cells were incubated with increasing concentrations of recombinant human or mouse IFN-λ (ng/ml) or human IFN-α, IFN-β or IFN-γ (IU/ml). After 24h incubation, ISG activation was assessed by measuring SEAP levels in the supernatant using Quanti-Blue™. EC50 is indicated for each cytokine (N/A: non applicable). Antibiotic resistance: Blasticidin, Hygromycin, G418, Puromycin, and Zeocin™. - HEK-Blue™ IFN-λ cells were stimulated by various cytokines. As expected, human and murine IL-28A and IL-28B and human IL-29 induced the production of SEAP. These cells do not respond to type I and type II IFNs (see validation data sheet). - Biallelic IFNAR2 and IFNGR1 gene knockouts were verified by functional assays, PCR and DNA sequencing. - The stability for 20 passages, following thawing, has been verified. - These cells are guaranteed mycoplasma-free.